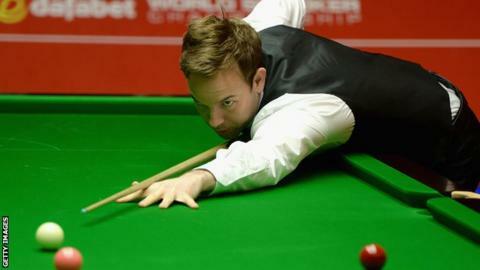 Ali Carter was given a standing ovation as he played his first game in the UK since returning from lung cancer treatment. The 35-year-old, who won the non-ranking General Cup title in Hong Kong last month, was cheered by the Coventry crowd as he took on Neil Robertson in the Champion of Champions tournament. However, the Australian world number two eased to a 4-0 win. Carter will play his first full ranking event in this month's UK Championship. He tweeted that he was "delighted to be back on the big stage" which had "seemed nearly impossible only a few months ago". "Thanks for all your support! Loved every minute of being out there! Roll on the UK!," Carter wrote on Twitter. After overcoming testicular cancer, Carter, who also has Crohn's disease, was diagnosed with lung cancer in May. He has undergone chemotherapy sessions and major surgery to return to the sport, but missed the Players Tour Championship in Bulgaria in September and the International Championship in China with a painful arm. Twice beaten in the World Championship final by Ronnie O'Sullivan, in 2008 and 2012, Carter's most recent ranking title was the 2013 German Masters. The Champion of Champions is a non-ranking event, with the final taking place on Sunday.